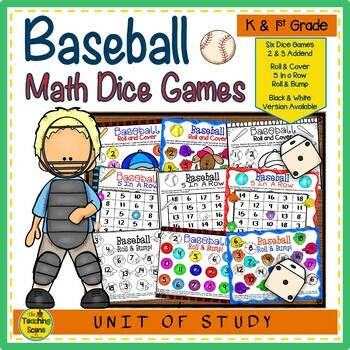 Baseball Math Centers or Small Group Games! To Practice 2 & 3 Addend Addition and Math Facts! Resource Prep: Print, laminate and cut all game cards. You can also print game cards back to back to save on paper or cardstock. Baseball Roll & Cover One Dice Roll : Roll one die and count your dots. Cover the number of dots you rolled with your marker. Two players will need to use two different colors. Covering the most numbers wins! Two Black Line Master Worksheets for this game included in resource. 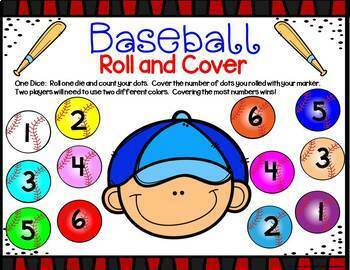 Baseball Roll & Cover Two Dice Roll: Roll two die and add your dots. Cover the number of dots you rolled with your marker. Two players will need to use two different colors. Covering the most numbers wins! Two Black Line Master Worksheets for this game included in resource. Baseball 5 In A Row Two Addend Addition: Children roll 2 dice and cover the sum. If the sum is not open, it is their partners turn. The person who covers 5 in a row first wins! The picture in the middle is a free space! One Black Line Master Worksheets for this game included in resource. 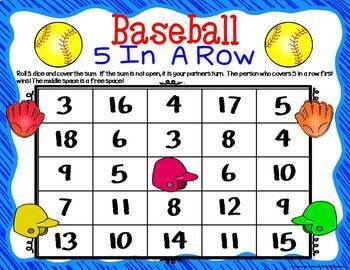 Baseball 5 In A Row Three Addend Addition: Children roll 3 dice and cover the sum. If the sum is not open, it is their partners turn. The person who covers 5 in a row first wins! The picture in the middle is a free space! One Black Line Master Worksheet for this game included in resource. 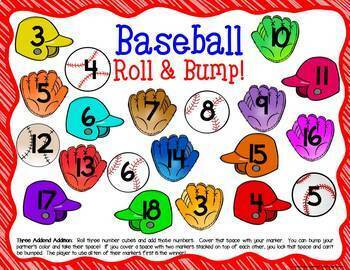 Baseball Roll & Bump Two Addend Addition: Roll two number cubes and add those numbers. Cover that space with your marker. You can bump your partner’s color and take their space! If you cover a space with two markers stacked on top of each other, you lock that space and can’t be bumped. The player to use all ten of their markers first is the winner! One Black Line Master Worksheets for this game included in resource. Baseball Roll & Bump Three Addend Addition: Roll three number cubes and add those numbers. Cover that space with your marker. You can bump your partner’s color and take their space! If you cover a space with two markers stacked on top of each other, you lock that space and can’t be bumped. The player to use all ten of their markers first is the winner! One Black Line Master Worksheet for this game included in resource. Kids have some baseball themed fun while learning their math skills!